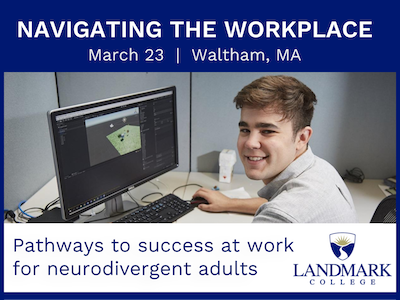 The Landmark College Institute for Research and Training (LCIRT) presents this one-day workshop for neurodivergent job-seekers and employees on March 23 at Bentley University in Waltham, MA. Organizations expected to attend include Microsoft, JP Morgan Chase, Fidelity Investments, MassGeneral Hospital for Children, and EY (formerly Ernst & Young). Click here for the full agenda and to register for this opportunity to learn more about the value of neurodivergence in the workplace.